Volume III - This is THE EYE OF THE PHOENIX. (Volume I was THE NEW ATLANTIS and Volume II was RIDDLES IN STONE!). 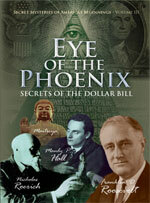 This nearly 3-hour documentary DVD discusses the occult secrets behind the dollar bill and the Great Seal of the United States! You will be amazed at how this never-before-revealed information ties into Bible prophecy. This DVD documents the Masonic and Luciferian connections behind the symbolism of our currency, drawing on original source writings by noted Masons, Rosicrucians and occult masters like Manly P. Hall and Nicholas Roerich. Bill discussed some of this material in the DVD: MONETARY RESTORATION, but this goes into INCREDIBLY greater depth. Is it any wonder that our economy is trouble when our money bears these cursed objects?